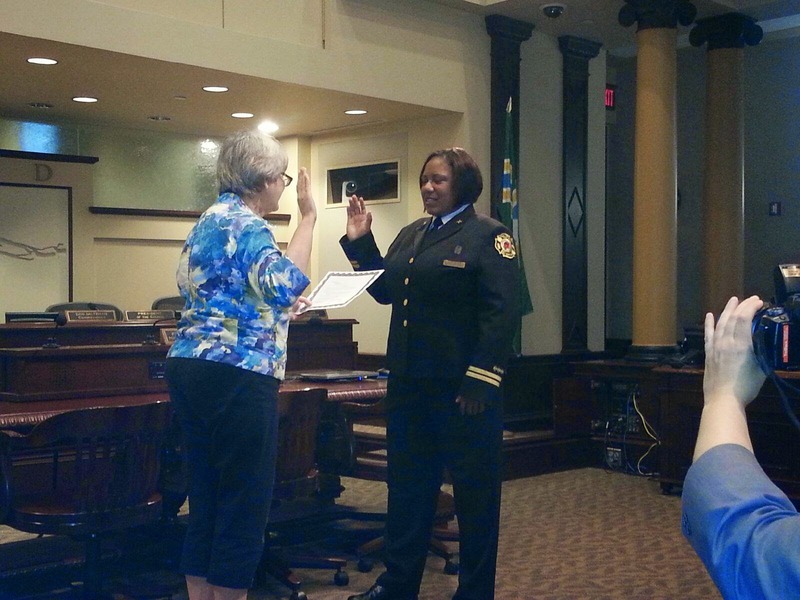 Sara Boone, who has served with Portland Fire & Rescue — the official name of the fire department in Portland, Ore. — for more than 19 years, has achieved another first, becoming the first African-American woman in the 131-year history of the organization to rise to the rank of Battalion Chief. Sara smiles for the camera during the awards ceremony. 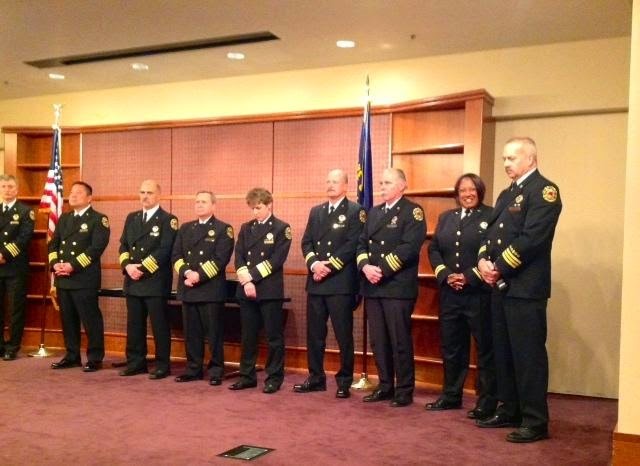 Sara was sworn into that position in July and then her promotion was recognized this month as part of a fall awards ceremony for Portland firefighters and civilians. That event took place at the Portland Building in downtown Portland. She is also, I’m proud to say, my sister. But in spring 1992, prior to graduating from Boise State University, she had no idea that a career as a firefighter awaited her. Instead, she was pursuing a career as a teacher which included student teaching at a Portland-area high school. She was teaching physical education at the time, but quickly became disillusioned with the job due to the size of the classes and the real-world problems her students brought to school. “I never chose firefighting, the fire department chose me,” she said. So one day when she decided to stay at school and eat lunch, rather than leave campus for a brief sanity break, a fire inspector showed up needing to see the girl’s locker room for a routine inspection. She showed the inspector around and the two struck up a conversation. Sara explained that she was unsure about whether teaching really was for her, and also expressed an interest in the Coast Guard, while the inspector encouraged her to take a crack at the fire department. Sara officially sworn in as a new battalion chief in July. Portland Fire was launching a six-month apprenticeship program to recruit more women and minorities, the inspector told her. The more Sara thought about firefighting, the more she realized it was for her. “Again, this was a chance encounter with a total stranger that changed my life forever,” she said. Her decision to pursue firefighting eventually led to some do-or-die moments, such as a physical agility test in which she had to climb, while connected to a harness, a 100-foot ladder in its raised position. “If I hadn’t had a strength and conditioning coach in school (Sara ran track and field at Boise State), building muscle mass and endurance over the years, I don’t believe I would have made it, or even thought I could be a firefighter,” she said. The entire process took more than two years: the six-month apprenticeship program was followed by nine months at the training academy and a year of probation before Sara joined Portland Fire in July 1995, the fourth woman and first African-American woman to make the department. And she still is the only African-American woman to this day. (If I could just editorialize for a moment, I’d say Portland Fire needs to do more in this area). Twenty people were in the original pilot program, but only 12 made it, including Sara. Still, the apprenticeship program has been part of Portland Fire’s hiring process for nearly 20 years, which has added more than 30 women to the rank of firefighter. -Worked at all 30 fire stations in the city. -Held the rank of lieutenant and captain, prior to being named a Battalion Chief. “Position wise, I think I’ve reached it, but I’m not sure what fate has in store for me,” she said.